Find out more about housing market in the Tampa Bay area. Sun City Center is a large active adult community near Tampa, Florida. It is a self-contained village complete with retail establishments, grocery stores, worship centers and a hospital. Over 11,000 residents enjoy this 55+ community for its reasonably priced homes, great amenities and an active lifestyle with nearly 200 clubs and interest groups. Located in an unincorporated part of Hillsborough County, 25 miles south of Tampa, FL, there is no government structure at Sun City Center. The community runs solely on volunteers. A membership association comprised of resident volunteers oversees all community amenities. The streets are golf cart permissible and residents can access shopping plazas, restaurants and the amenities via golf carts. Popular with retirees from across the country, the area enjoys over 300 days of sunshine a year, and a mild three season climate means outdoor activity is possible nearly every day of the year. The community’s proximity to Tampa, the Gulf of Mexico and other notable attractions make it a desirable option for active adults and retirees. Whether your interests include golf and tennis or crafts and cards, the abundance of amenities and lifestyle activities in this community provide the perfect destination for 55+ aged adults who want to get the most out of life. The Kings Point Clubhouse is available to all residents of the gated Kings Point neighborhood within Sun City Center. Use of the facilities is included in the monthly homeowner’s association fee. Clubhouse – 97,000 Sq. Ft.
Club Renaissance – 43,000 Sq. Ft.
Club Renaissance is a private clubhouse reserved for the residents of the Renaissance community. Residents of this community may optionally join for $2,083 per person per year. This fee does not include golf. The Sun City Community Association South Campus is available to residents of Sun City Center including Kings Point and Renaissance. Use of the South Campus is included in the monthly homeowner’s association dues. The Sun City Community Association North Campus is available to residents of Sun City Center including Kings Point and Renaissance. Use of the North Campus is included in the monthly homeowner’s association dues. There are plenty of activities available in Kings Point. Here is a sample of some of the clubs, activities and classes offered here. Kings Point is a gated active adult neighborhood in Sun City Center, Florida. The community enjoys convenient golf cart access to the retail and dining establishments in Sun City Center. This 55+ community has two private clubhouses, golf courses and many wonderful activities. Despite the fact that this community is located within the greater Sun City Center area, it is not directly affiliated with the Sun City Center association. Kings Point has separate legal boundaries, different bylaws and over 100 condo associations. While Sun City Center is primarily comprised of single-family dwellings, most units in Kings Point are attached villas and tend to be newer than units in the original area of Sun City Center. Since construction began in the early 1970s, retirees from across the country have flocked to the community in search of a warm climate, an active lifestyle and low-maintenance living. The region enjoys 300 days of sunshine a year and a mild three-season climate that makes outdoor activity possible nearly every day of the year. This active adult community is convenient to many desirable nearby destinations that include world-renowned beaches, the culture of Tampa and the many attractions of Orlando and central Florida. This age-restricted community consists of 96 condo buildings available on a resale-only basis. Residents enjoy a low-maintenance lifestyle thanks to the established homeowners’ association that takes care of exterior-home care. The East Recreation Center is the main clubhouse that’s located at 2069 World Parkway Blvd. East. The West Recreation Center is the second clubhouse for residents. It’s located at 2291 World Parkway Blvd. West. Timber Pines in Spring Hill, FL enjoys a spectacular location along the Gulf Coast in the Tampa Bay area. This beautiful gated golf community is open to residents aged 55 and better, and offers an impressive array of amenities. Golf enthusiasts will feel particularly at home with four golf courses, which total 63 holes of great golf that will provide challenging and enjoyable play for any golfer, regardless of skill. Even non-golfers will appreciate the country club lifestyle, various amenities and plentiful social clubs. While there is much to do within this 1,400-acre community, there is even more to explore in the nearby city of Tampa. From the Gulf Coast Beaches to Tampa’s fine dining, shopping and recreational attractions, there is something for everyone at Timber Pines in Spring Hill, FL. Residents of Timber Pines enjoy a myriad of great amenities inside the Resident Activities Center. The Performing Arts Center hosts professional and amateur acts for plays and performances. The Country Club of The Pines offers casual and fine dining. There are plenty of activities available in Timber Pines. Here is a sample of some of the clubs, activities and classes offered here. Situated amidst the sparkling waters of Tampa Bay, Florida and among the scenery of the 1,300-acre Wolf Branch Creek Nature Preserve, MiraBay welcomes residents of all ages. The unique combination of low-maintenance homes, desirable amenities and a socially active lifestyle make this community appealing to most homebuyers. Here, a variety of Tampa’s most reputable builders offer single-family homes that all harmonize to create a neighborhood with pleasing coastal architecture. Upon completion, the community is expected to encompass approximately 1,700 homes. MiraBay Club – 10,000 Sq. Ft.
Valencia Lakes in Wimauma, Florida is a 55+ community adjacent to Sun City Center. Situated just 25 miles south of Tampa, Valencia Lakes has attracted adult buyers with state-of-the-art amenities, a very active lifestyle and luxurious new construction homes at reasonable prices. For buyers who cherish the Sun City Center location but prefer newer homes, world-class amenities and a lifestyle tailored around socially active and fitness-minded individuals, look no further than Valencia Lakes in Wimauma, Florida. With a plan for approximately 1,540 homes, this 55+ community provides a tight-knit, small town feel in a gated setting where neighbors are close friends and residents know each other by name. Clubhouse – 40,000 Sq. Ft. There are plenty of activities available in Valencia Lakes. Here is a sample of some of the clubs, activities and classes offered here. Clubhouse – 35,000 Sq. Ft.
Heritage Pines is an active adult community located in Hudson, FL on the central west coast of Florida. Heritage Pines is close to beaches, great shopping, sport fishing, professional sports, and performing arts. Situated in rolling pine forests among lakes on Florida’s Nature Coast, Heritage Pines has its very own private 18-hole golf course. It winds through conservation areas with sparkling lakes and ponds. For a grand finish, the 18th hole is located on a peninsula in the lake beyond the country club. Clubhouse – 18,500 Sq. Ft.
Heritage Springs is an active adult community located in Trinity, Florida. This gated community is comprised of five individual subdivisions of single-family homes and 19 subdivisions of attached villas. Heritage Springs has its own 18-hole championship golf course, driving range, and putting area. Membership in the semi-private Heritage Springs Golf and Country Club is included with every home purchase. Located at the edge of Pinellas, Pasco, and Hillsborough counties; Heritage Springs is close to beaches, great shopping, and wonderful restaurants. Scenic walking and biking trails, community parks, and playgrounds surround this private neighborhood. Heritage Springs in Trinity offers luxurious on-site amenities and many scheduled events. There are plenty of activities available in Heritage Springs. Here is a sample of some of the clubs, activities and classes offered here. Wellington at Seven Hills is a beautiful 55+ community in Spring Hill, Florida. This lovely active adult neighborhood features a spacious clubhouse with plenty of amenities to support a healthy, active lifestyle. There is a fitness center, an outdoor swimming pool, an arts and crafts studio and much more. There are approximately 1,100 homes within the Wellington at Seven Hills community, including exquisite single-family homes, maintenance-free patio homes and attached villas. Clubhouse – 30,000 Sq. Ft.
Southshore Falls in Apollo Beach, Florida offers exquisite 55+ living in one of Tampa’s most exciting neighborhoods just minutes from the beach, shopping, entertainment and more. This intimate 866-home community offers exquisite resale homes and villas at affordable prices. A community clubhouse, two lagoon-style pools, and many activities are just a sample of what Southshore Falls has to offer. Southshore Falls is in a premier location nestled just steps from the sparkling waters of Tampa Bay. It offers the perfect blend of small-town feel with proximity to big city attractions. For buyers who cherish the Sun City Center location but prefer newer homes, world-class amenities, and a lifestyle tailored around socially active and fitness-minded individuals, look no further than Southshore Falls in Apollo Beach, Florida. This maintenance-free community provides a harmonious setting from the moment you drive through the gates. An abundance of colorful landscaping, ponds and walking trails adorn this 55+ community, making your new home feel like a world-class resort. Wellspring Club – 14,000 Sq. Ft. There are plenty of activities available in Southshore Falls. Here is a sample of some of the clubs, activities and classes offered here. Del Webb will begin construction on a new 55+ active adult community in 2018. Named Del Webb Bexley, this community will feature a large clubhouse with many amenities and activities for residents to enjoy. An on-site lifestyle director will help to plan additional clubs, seminars, classes, and fun things for everyone to do. A homeowners’ association fee takes care of common areas and home maintenance, making sure you’ll never have to mow your lawn again. Del Webb Bexley in the Tampa Bay Area is sure to include something for everyone in Land O’Lakes, Florida. The amenities at Del Webb Bexley will begin at the proposed 17,000 square-foot clubhouse. There will be a state-of-the-art fitness center and aerobics studio for those looking to stay in shape. It will feature a grand ballroom for throwing large events and a game room for playing cards with friends or shooting some billiards. The food and beverage center will be the perfect place to grab a quick snack. There will be an arts and crafts studio and many multi-purpose rooms for meeting with neighbors, or holding classes, seminars, and special activities. Outdoors, there will be a resort-style swimming pool and patio. Tennis, pickleball, and bocce ball courts will provide many sporting opportunities for exciting competitions. An outdoor amphitheater with an event lawn will be the perfect place to see a live band play and dance in the grass on the weekends. Residents will walk or bike along the winding trails throughout the neighborhood as they visit the community gardens or dog park, taking in the beautiful parks, natural spaces, and scenic lakes on the way. While final floor plans have yet to be released, homebuyers in Del Webb Bexley can rest assured knowing their homes are built to the highest quality with the best appointments by master homebuilder Del Webb. Construction will begin in 2018 with plans to host 850 single-family homes in this 489-acre community upon completion. You’ll live an active lifestyle in this 55+ community thanks to the full-time activities director who will be on staff. Like any Del Webb community, there will be many resident clubs, classes, and activities for everyone to enjoy. A homeowners’ association will help you relax, knowing that the common areas and exterior maintenance of the homes will be taken care of. Take a dip in the swimming pool, try a fitness class with friends, or cultivate a new hobby in one of the many multi-purpose rooms available in the clubhouse. Silverthorn in Brooksville is a prestigious semi-private golf club community. One of the most sought-after gated neighborhoods in Hernando County, Silverthorn is home to a highly regarded 18-hole golf course designed by Joe Lee, as well as a host of other world-class amenities. 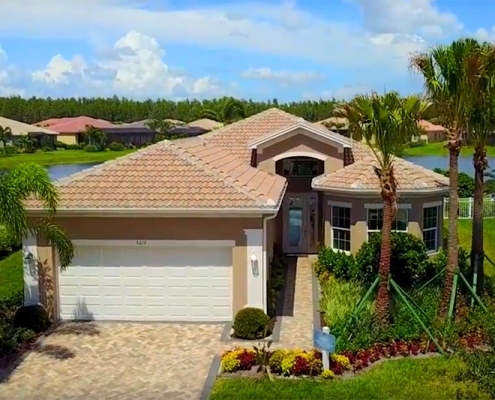 Developed between 1997 and 2011, this gated community includes a walking and biking trail system that connects to the local Suncoast Trail. Residents also have use of a secure walled lot for RV and boat parking. This community consists of a total of 801 single-family homes and attached villas. Clubhouse – 25,000 Sq. Ft. There are plenty of activities available in Silverthorn. Here is a sample of some of the clubs, activities and classes offered here. Summertree is a gated 55+ community in New Port Richey, Florida. This active adult community is nestled among lush landscaping with mighty oaks and tall pines. The setting provides a beautiful oasis for active adults where they can enjoy a well-appointed clubhouse, plenty of amenities, golf course views, and many social activities in this low-maintenance community. This public golf course is available to residents of Summertree for a fee. There are plenty of activities available in Summertree. Here is a sample of some of the clubs, activities and classes offered here. The Groves Golf and Country Club in Land O’ Lakes, Florida is a beautiful golf course community for those 55 and over just north of Tampa. Whether you’re looking for your dream retirement oasis in the Sunshine State or a winter retreat, The Groves Golf and Country Club is the perfect choice. The community offers Florida living at its best featuring equity club ownership and maintenance-free living. With just 754 homes at The Groves Golf and Country Club, residents enjoy an intimate setting where neighbors are friendly and residents know each other by name. Civic Center Clubhouse – 15,000 Sq. Ft. There are plenty of activities available in The Groves Golf and Country Club. Here is a sample of some of the clubs, activities and classes offered here. There are plenty of activities available in Bay Island. Here is a sample of some of the clubs, activities and classes offered here. There are plenty of activities available in Medley at Southshore Bay. Residents continually plan fun neighborhood events and activities. There are also numerous clubs and interest groups that meet regularly to participate in everything from cards and games to book discussions, hobby groups and more. Heritage Lake is a 55+ community located in New Port Richey, Florida. This age-restricted community features great amenities, affordable low-maintenance homes, and a social environment that caters to active adults and retirees. Heritage Lake offers homebuyers a quiet setting with only 585 residences located within a lush landscape of scenic lakes and ponds. Residents of Heritage Lake enjoy living in a prime location within the Tampa Bay area that’s close to shopping, dining, medical facilities, and plenty of attractions. There are plenty of activities available in Valencia del Sol. Residents continually plan fun neighborhood events and activities. There are also numerous clubs and interest groups that meet regularly to participate in everything from cards and games to book discussions, hobby groups and more. Esplanade at Starkey Ranch is a new active lifestyle community in Odessa, Florida. This gated neighborhood is situated on 225 acres of lush landscaping and is within the master-planned community of Starkey Ranch. Renowned builder Taylor Morrison plans to develop 517 homes in Esplanade at Starkey Ranch and will offer ten unique designs. Not only will this vibrant community have quality-built homes, but it will also provide residents with top-notch amenities to keep them active throughout the year. Located 30 minutes from downtown Tampa, Esplanade at Starkey Ranch allows residents to have easy access to all of the big-city entertainment and attractions without having to travel too far. Homeowners will also be close to parks, trails, and nature preserves as well as have plenty of shopping and dining options. Clubhouse – 6,000 Sq. Ft. There are plenty of activities available in Esplanade at Starkey Ranch. Here is a sample of some of the clubs, activities and classes offered here. Located on Honeymoon Island, active adults are surrounded by wildlife, nature, and outdoor recreation. Honeymoon Island State Recreation Area and Pinellas County State Aquatic Preserve are just outside of the community’s entrance. Sandy beaches are plentiful in the area as well, making this vibrant age-restricted neighborhood an island paradise for active adults in the Tampa Bay area. Boca Ciega Point is a gated 55+ boating community located in St. Petersburg, Florida. Boca Ciega Point appeals to the 55+ homebuyer because it offers a relaxed lifestyle with quality resale homes. The majority of homes in Boca Ciega Point have waterfront access, which caters to retirees who like boating and other water activities. This age-restricted neighborhood also has a great lineup of amenities and plenty of social activities that keep residents busy all year long. Ideally situated in the Tampa Bay area, Boca Ciega Point is near major highways and is close to many attractions. The St. Petersburg shoreline provides many water activities like fishing, sailing, and boating. Homeowners can also visit museums, golf courses, parks, beaches, and other recreational activities that are just a few miles away. There are plenty of activities available in Boca Ciega Point. Here is a sample of some of the clubs, activities and classes offered here. Pinehurst Village is a condo community in Dunedin, Florida. It consists of 240 condos that were constructed from 1973 to 1976 and continually updated since. There are six shuffleboard courts and a pool outside a community clubhouse. Less than half-an-hour away from Clearwater and Tampa Bay, this 55+ active adult community is near shopping, dining, and entertainment opportunities. There are plenty of activities available in Pinehurst Village. Here is a sample of some of the clubs, activities and classes offered here. Encore at Fishhawk Ranch is a new 55+ community coming to the Tampa Bay area in Florida. This gated active adult neighborhood, located within the master-planned community of Fishhawk Ranch, is being developed by David Weekley Homes and will consist of 240 single-family homes at completion. Homebuyers will enjoy the beautiful single-story designs and low-maintenance exteriors that cater to active adults in this welcoming environment. The community also has a private clubhouse full of world-class amenities for 55+ residents as well as a long list of social activities and an on-site activities director. Located in Lithia, FL, active adults will enjoy everyday conveniences nearby such as shopping, dining, and attractions. Major roadways are close by so driving around town is a breeze, and Tampa is just 40 minutes away for additional entertainment and recreation. Oasis Lifestyle Club – 5,000 Sq. Ft. Active adults also have access to the master-planned community amenities listed below. There are plenty of activities available in Encore at Fishhawk Ranch. Here is a sample of some of the clubs, activities and classes offered here.